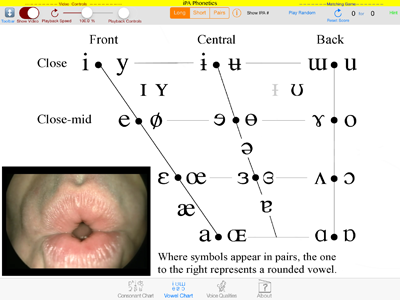 This APP provides a unique and intuitive touch interface for exploring the International Phonetic Alphabet as well as numerous voice qualities and articulations. Simply press any symbol or label in the charts to see and hear an illustrative example. Test your knowledge by playing the random guessing games. Amazing laryngoscopic and ultrasound videos accompany sounds articulated in the throat!